ANNE RIVES WHITE JONES, a long-time and prominent resident of Santa Barbara, died on January 8, 2016 at age 94. Anne truly savored life as a member of our “greatest generation.” Born to Dr. Thomas Wistar White, a pediatrician, and Cora Lee Maury White on April 5, 1921 in St. Louis, Missouri, Anne obtained her Bachelor’s and Master’s degrees from Washington University, studying under and assisting the famed Greek archeologist and historian, Dr. George Mylenos. Much to her father’s anguished concern, Anne joined the American Red Cross in 1944 and was posted first to Cambridge and then to Provence, France where she set up and ran canteens for the troops. It was in Aix-en-Provence that she met the love of her life, Major Robert M. Jones, Bob, who had been admitted to the California bar immediately prior to his enlistment. Upon her return to St. Louis after the war, she convinced Bob that his army days were over and they married and settled, first in Woodland, California and shortly thereafter in Santa Barbara. Bob became a member of the law firm of Price, Postel and Parma where he practiced law for the next 50 years. 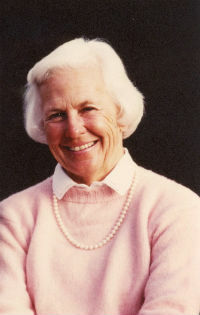 Anne energetically pursued her own career as a community volunteer, and played increasingly important leadership roles in Santa Barbara institutions such as the Santa Barbara Museum of Art (where she initiated the docent program), Santa Barbara Botanic Garden (president), Santa Barbara Board of Education, the American Red Cross (board member), Junior League of Santa Barbara (president), and the Garden Club of Santa Barbara (president). She was also a founding trustee of Lotusland. As president of the Montecito Resident’s Association, she was instrumental in the reorganization of Casa Dorinda. Anne was certified by the Garden Club of America as a master judge of flower shows, and she and Bob had a hand in the organization and development of Alice Keck Park Memorial Garden in downtown Santa Barbara. To know Anne was to know her garden, which she shared with enthusiasm and generosity. And what a garden it was. Her husband was her ever useful helpmate as she produced a place of beauty and wonder, earned through endless hours of stooping to plant and kneeling to weed. Its creation was ongoing, and it provided a completely appropriate setting for her and Bob’s lives, the lives of their family, and those of their friends and friends of friends. Anne is survived by her four sons, Thomas Wistar Jones (Amanda), Robert M. “Grigger” Jones, JD (Alice), William Maury Jones, PhD (Sarah) and Richard Saunders Jones (Kathy), her eight grandchildren, Commander Andrew Jones US Navy (Ali), Dr. Carolyn McGaughey (Ryan), Nancy J. Sylvester, JD (Chris), Esther Jones, Eleanor Jones, Isabel Jones, Annie Jones, and Peter Jones, and her five great-grandchildren. The family would like to thank the staff of the Personal Care Unit of Casa Dorinda (Peggy, Ann, Rufina, John, Lenore, Mauricio, Irma, Shelly, and Brigette) and Janet from Visiting Nurse & Hospice Care for their understanding and compassion. A celebration of Anne’s life will be held on February 27 from 2 – 4 pm at Casa Dorinda, 300 Hot Springs Road in Montecito. In lieu of flowers, memorial gifts may be made to Santa Barbara Botanic Garden, Santa Barbara Museum of Art, Lotusland, or Planned Parenthood in Anne’s name.